Hilary is a small but strengthening hurricane, with hurricane-force winds extending outward up to 10 miles (20 km) from the center. Tropical-storm-force winds extending outward up to 60 miles (95 km). 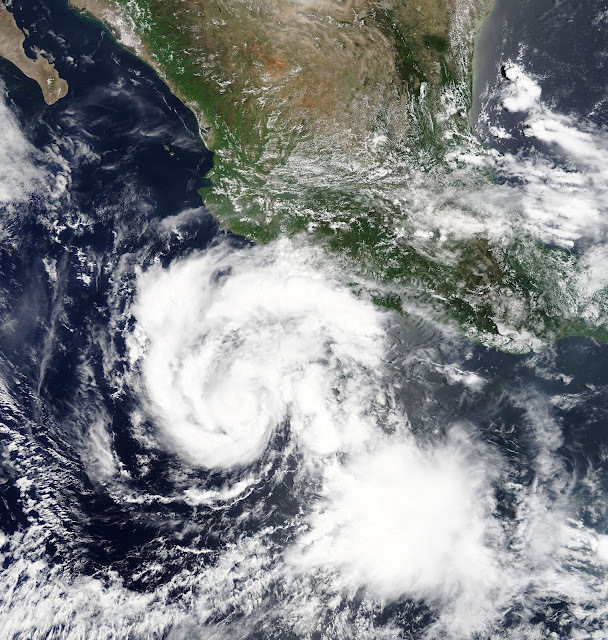 Hilary began when Tropical Depression 9E formed on July 21. By July 22 at 11 p.m. EDT, the depression strengthened into a tropical storm and was re-named Hilary. At 5 a.m. EDT on Monday, July 24, 2017, Hilary rapidly intensified into a hurricane. NASA's Moderate Resolution Imaging Spectroradiometer, or MODIS, instrument aboard NASA’s Terra satellite captured a true color image of Hurricane Hilary on July 24 at 11 a.m. EDT. The image revealed a better organized tropical cyclone. The National Hurricane Center (NHC) noted "Satellite images indicate that Hilary has a small central core of convection, with both the visible and infrared channels suggesting that an eye is trying to form. Microwave data also show an incomplete eyewall." At 11 a.m. EDT (1500 UTC), the center of Hurricane Hilary was located near 14.1 degrees north latitude and 104.2 degrees west longitude. That's about 340 miles (545 km) south of Manzanillo, Mexico. Hilary is moving toward the west-northwest near 8 mph (13 kph), and the National Hurricane Center said this general motion with some increase in forward speed is expected over the next 48 hours. Maximum sustained winds have increased to near 80 mph (130 kph) with higher gusts. The estimated minimum central pressure is 989 millibars. The National Hurricane Center expects Hilary to become a major hurricane on Tuesday, July 25.